As some of you may be aware, Allegro is beginning a pretty aggressive and bold new vineyard planting this spring. In fact, it all breaks loose in about three weeks when the vines show up from the nursery. This is the culmination of a dream of sorts. I came to Allegro thinking I was going to make great wine, fully realizing that it may only be a few vintages in my lifetimes that I pull of something spectacular. That’s just the way Mother Nature works. But as I matured in this industry, I realized a little more. It turns out that our viticultural skills have increased. We are much better than we ever were at growing good grapes as an industry, let alone at Allegro. (And with the addition of Nelson Stewart as our vineyard manager, things will only get better.) (Nelson has a long association with great wines, from Black Ankle and Boordy in Maryland to Karamoor in Pennsylvania.) We’ve always known our site was perfect for grapes, and now we’ve added better skills to its management. Pit at Allegro. 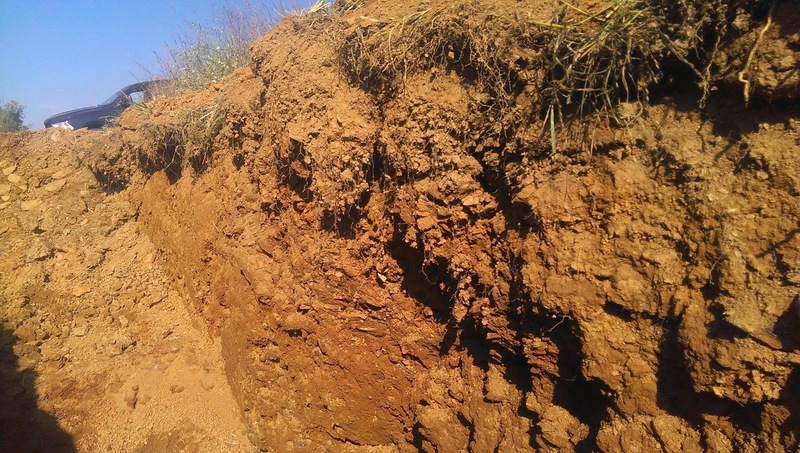 Perfect soils. Finally, we’re adding better grapes. As with anything, there has been evolution in the vineyard world with respect to clones and rootstocks. Where the original Allegro vineyard planted in 1973 used the highest technology from California at the time, this year’s planting will be very Euro-centric with better materials, vines, and understanding of what works best with our site. Our goal is to produce world-class wines from our vineyard on a yearly basis. And, with that high-requirement will come a higher-than-normal price tag for the wines (unfortunately). In order to produce better fruit, the density of the planting is increased exponentially and therewith the cost of the planting is increased exponentially. It's not cheap to grow grapes, and it's really expensive (planting and yearly labor costs) to grow great grapes for great wine. Here’s where I am hoping that you all will come through and support what we’re trying to accomplish. These wines will be priced starting at around $25 per bottle (that’s my guess), and I have a sneaking suspicion that the top wine will be around $50. Yes, that’s a wide-range, I know. But, we won’t really know until all the costs shake out and we actually have some of this wine in the bottle and ready for sale. We’re talking 2019 before we’re there. So, our wines from this vineyard will be priced at a point where there’s a great ROI (return on investment.) If I was in MD or northern VA, you can bet I would be pricing them a good $20-$30 higher. But, I’m not. We’re here in southern PA. In York county. In the Brogue, for crying out loud. Nobody would take me seriously if I tried to sell a $100 bottle of wine…..or would they? I don’t know. Someday, maybe. But, I promise you, that our top-end wines, when they finally get ready for sale from this amazing new vineyard we’re planting, will blow your mind in terms of what you ever thought about Pennsylvania wines. And they’ll be at Brogue prices. I can’t wait to share them with you all. This is an adventure of a lifetime, and we’re glad you’re along for the ride. Very informative article! I have always thought your prices were modest, and I have no doubt that will continue with the new label. I am very excited by the prospect of super premium Allegro wines, and will certainly support the cause! Can't wait for the next write up, as well as our next (long overdue) visit to Brogue! Thanks, Nick. We've got some other reserves coming online here this year as well. Looking forward to seeing you guys. I personally and professionally am looking forward to this! Thanks, Marty. I'm personally looking forward to it more than professionally looking forward to it. Lots of work, but the end justifies the means.